Welcome to Passenger Ship Avanti. 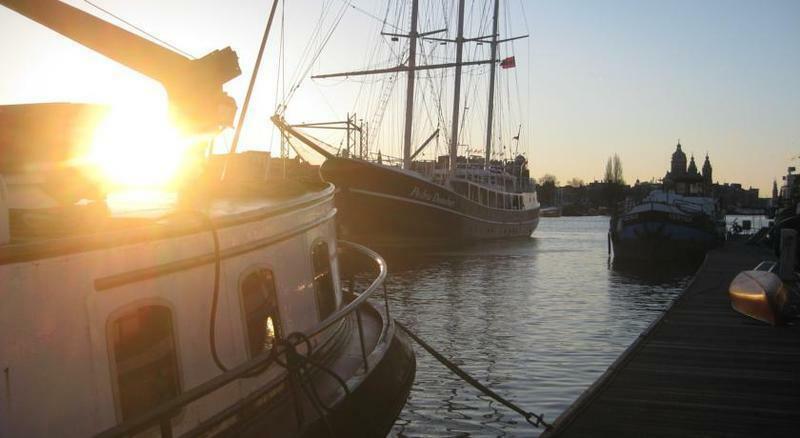 A nice and different way to enjoy your B&B in Amsterdam is to stay aboard the Passenger ship Avanti. The Avanti offers a clean and comfortable accomodation along a canal right in the middle of the city. The Avanti is situated in the centre of Amsterdam. Docked at the Oosterdok in the Nautisch Kwartier (Nautical Quarter), it is only a few minutes walk from the Central Station. From its location, many attractions of the city centre, such as the canals, Waterloo and Rembrandt Square, the Artis Zoo, many museums are at walking distance. Also facilities such as a bank, post office, supermarket, bike rental are close at hand. Ask for the special bike rental fee (genuine rotten dutch bikes) or free internet which are both nearby. The range of guests is very wide; it is very well possible that ten different nationalities have breakfast at the same time! The Avanti has fifteen practical cabins with bunk beds (2 metres = over 6 ft 6). At the end of the hall, there are Three toilets and four showers. Upstairs, next to the salon, there are another two toilets. Each cabin has its own wash basin and a cupboard. There is central heating throughout the ship. - Cash only upon arrival. - Check-out time is 10.30. - The booking is to be paid upon arrival in cash only. - No smoking in the cabins. - No using of any kind of drugs in the ship. * Walking from the Central Station, it takes about 10 to 15 minutes to get to the Avanti. Leaving the Station at the front, you cross the large bridge and turn left. You walk along the Prins Hendrikkade towards the IJ-Tunnel. Just before the tunnel you will find the Oosterdok on your left. The Avanti is moored on Jetty 2 just beside the historical VOC ship. Another well recognisable neighbour is Nemo, a large green building that looks like a ship. It is built right on top of the IJ-Tunnel. * By car, the thing to do is get to the circular highway (Ring A10) of Amsterdam. From the North side of the A10 you take the exit S116 (Centrum) and go through the IJ-Tunnel. At the end of the tunnel you turn right at the traffic lights, onto the Prins Hendrikkade. Directly after the lights there is a bus stop. Turn right immediately after the bus stop (before the bridge) and you will go round the corner, down to the jetties of the Oosterdok. * Parking space directly next to the jetties is limited and expensive ( 3,40 per hour!). It is possible to use these spaces shortly to unload and then park in a different part of town, where parking is cheaper or even free. Free parking is only a few bus stops from the Oosterdok.